The company became known as Nuneaton Engineering Company in 1880, when Reginald Stanley bought the foundry from Messrs Hall, West & Co to complement his growing empire. Mr Stanley had ideas for his brickyards and collieries, but needed a place that could cope with the engineering demands and the big projects. Hall & West had established some of the finest skilled workers in the area and where on call for repairs in all parts of the country. The man who first set up the company was William Hall, a staunch Freemason. He never seemed to stayed in one place too long as you'll read below. William Silver Hall, born 17th June 1844 in a small village on the north boarder of Leicestershire. He was educated at Ashby De La Zouch and Atherstone Grammar Schools early in his life, then on to Brighton College. 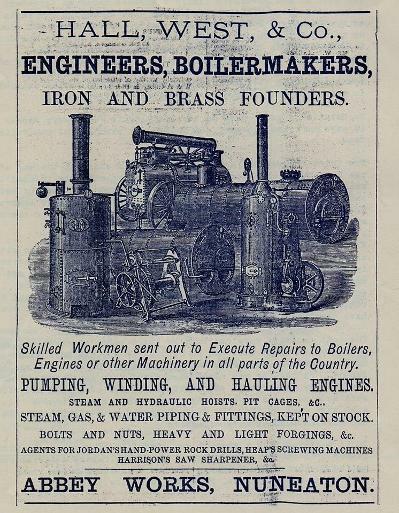 On leaving college he learn't his trade at Messrs Sharp, Stewart & Co, Steam locomotive manufactures of the Atlas Works, Manchester, where he worked in the draft office as an apprentice for three years (1863-1866). In July 1870, William was working at Babbington Coal Company, near Nottingham as a Mechanical Engineer and was a paid up member of the Institute of Mechanical Engineers by 1871. 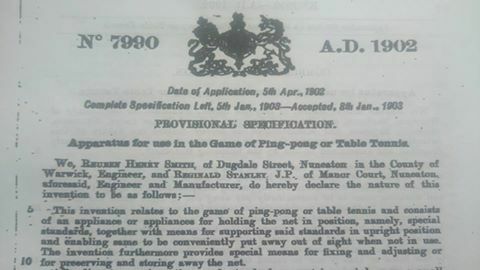 Advert taken from the Nuneaton Observer, January 1880. In January 1874, William left Babbington and commenced his own business in Nuneaton as a Mechanical & Consulting Engineer. He focused on the manufacture of Engines, Boilers, Machine Tools, Pumping and Winding Apparatus for Collieries, but also dabbled in other types of Machinery. By early 1877, Mr Charles Dickinson West joined the blossoming firm and its named changed to Messrs Hall, West & Co. The partnership didn't last for long, Charles was taken ill and in 1880/81 it looks like Reginald approached the pair with an offer they couldn't refuse. 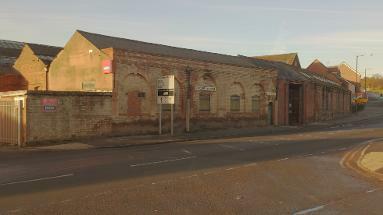 Soon after, William, set up business in Derby with another engineer J H Clarke at the Canal Street Iron works, where he was a senior partner. Come the end of the century his knowledge and experience saw him leave these shores for Japan and Takata & Co. His engineering skills were used on various jobs including steel bridges, manufacturing plants, cotton factories to the erection of new law courts and hospitals. 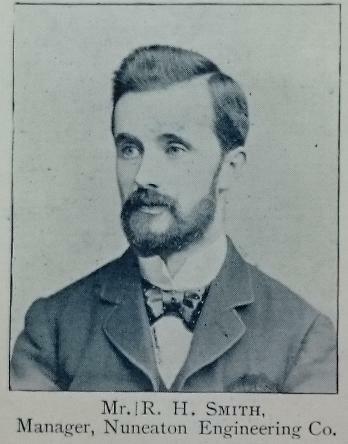 William sadly passed away 26th July 1906, of cancer and was interned at Aoyama Cemetery, Japan. *taken from the Institute of Civil Engineers membership renewal. Reginald set about expanding the business, he built a new foundry on Tuttle Hill. Below were the plans for a proposed extension to Stanley's Globe engineering, has anyone heard of it? It matches the location on the map in the bottom left corner. 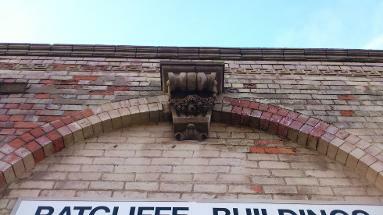 The building is still in place now and Nationwide Engineering and Tool's Limited (GCM Construction) are based there and is known as the Ratcliffe Buildings. On a visit in 1896 by a Nuneaton Observer reporter, he was shown the workings of the busy fitting shop. They were described as a hive of activity with cranes travelling overhead, and on all sides lathes are revolving merrily. We see an employee engaged in boring through a brass collar, another is busy at a lathe, while in another part, we see yet another who like the proverbial blacksmith is making 'the sparks fly like chaff from the threshing floor' . Left - A plan of the proposed extension to the foundry. Ref - Nuneaton Plans at WCRO. Top right and right bottom - The Nuneaton Engineering building's in 2015. 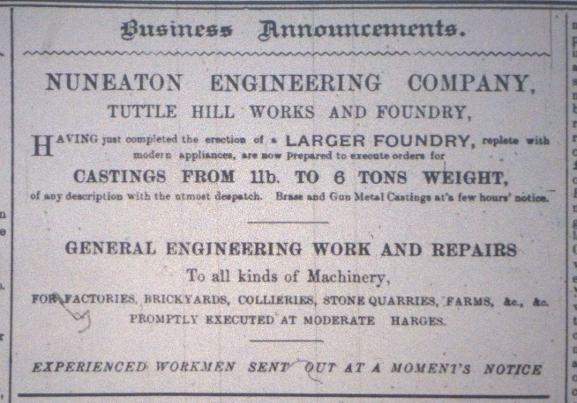 Nuneaton Engineering Co didn't just deal in general machine works and repairs, they also made metal castings. While on your journeys around Nuneaton, you'll more than likely pass a gutter or drain path cover with the companies name on it (see below). Mr Stanley's head was full of ideas and the connection between the brickyards and collieries would become apparent over the coming years (although when Stanley Bros turned into a limited company it was ran as a separate concern) and I'll show you some of the inventions that where patented by Mr Stanley and the company. Above - A Nuneaton Engineering Co drain path cover on Heath End Road. Below - A Nuneaton Engineering Co drain cover in Cox's Close. 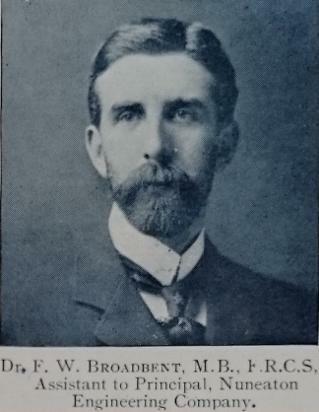 Reuben joined the firm around 1890 as an engineer, he came from Gloucestershire with vast experience and within three years he joined the management team, where in 1902 he held the managers position. He worked on various project with Reginald one being the design of ping pong (table tennis) apparatus. During his leadership the company was producing for the coal and brick industries some of the most innovative and market leading machines, including the 'Stanley' Multiplex Die Tile Press, The Coal Heading/Tunnelling Machine and The 'Stanley' Water Roll Quartz Mill to name a few. Francis isn't a stranger to the website and crops up all over the place, he was also employed by Stanley Bros as the Brickyard Manager and helped Reginald in quite a few of his other duties around town. His position with Nuneaton Engineering wasn't quite as prominent but was worth of a mention in the 1902 coronation booklet. You can read more about Francis here. The 'Stanley' Tile Press machine was designed by Nuneaton Engineering Co and exhibited at the Building Trades Show at The Royal Agricultural Hall, London in 1901. It got rave reviews by tile-makers who saw this machine at work, adding that it will completely revolutionise the tile-making industry. The following article was taken from The Stone Trades Journal and it explained the enormous capabilities it would have for the buyer. The machine is fed, in the usual manner, by means of a hopper and feed box, this feed box serving in its advance ten die chambers simultaneously. A cam motion brings the plungers to bear upon the dust and delivers the ten tiles vertically on to a tray in readiness to be carried direct to the kiln. Time and cost saving of this machine was immense. The ten tiles are made with one revolution of the cam, the cam turns five times a minutes, so the output would be 3000 tiles per hour, or 150,000 per week (based on 50 hour week). The processes other great advantage was that the machine made the tiles vertically, so that the face of the tile has a finish and smoothness along with a inform weight and density impossible to copied by any other action. This method will make ten times more tiles and at one tenth of the cost. The tiles are made from semi-dry clay, which can be taken from the face and having been panned through an 1/8 inch grid, is then ready to be conveyed to the hopper of the machine. Once the tiles are made, they don't require placing on drying floors thereby saving time and labour. In the early 20th century, Nuneaton Engineering had made a machine that would make such a difference in the coal getting industry. 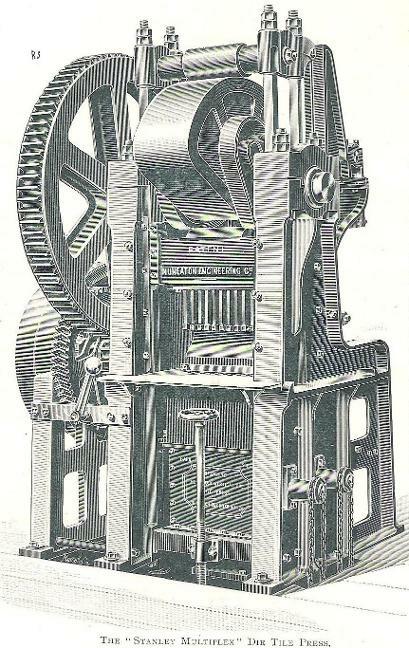 The 'Stanley' heading machine was used in many collieries around the world. In the colliery manager handbook of 1904, the machine had been in use since 1894 and had never been displaced by later inventions (if such have been attempted) intended for the same purpose, which is the rapid driving of long headings or narrow places of coal. The illustration above show the annular groove cutting machine. It consists of a pair of arms carried at the end of a cross bar, which forms the diameter of the circle in which the machine works, and the centre of this bar is connected mechanically to a strong shaft, which is again geared to the shaft of the driving engines. Cutting tools are fixed to the arms and as the shaft carrying the cross bar is rotated an annular groove is cut by them in the coal, leaving a cylindrical core of coal, which, unless very stubborn, falls off in pieces every foot or so of advance as the work proceeds. The machine in operation is brought close up to the face and chocked in position. It is provided with four telescopic screw pins, by means of which the frame is held securely in position while the cutters are at work. The cutting arms full length is 4 1/2 feet and once reached the machine is stopped and the frame then advances forward by loosening the screw pins and the back gear is engaged. Once the frame had moved as far the the thread will allow the process of chocking and pinning is repeated. In the Colliery Managers Handbook the time saved compared to hand labour is said to be four times faster, reaching 4 tons per man per shift, along with the reduction in the cost of working per man. The heading machine requires two attendants, one to control the engine and the other to pass the cuttings back as they are delivered. It comes in size to cut a core from 4 feet to 7 feet 6 inches in diameter and advance in 3 inches for each size. A machine has been made to cut the whole coal face away instead of an annular groove (right), cutting the coal in small chips, which are delivered behind the machine onto the conveyor shown. Also available is the 'Stanley Duplex Electric/Air Heading Machine' (below right) this was a double headed machine and worked in virtually the same way as the single. Around the early 20th century you could purchase one of these cost effective machines for £250 or in today market about £27,500. The working of this amazing equipment are a joy to see in motion and all credit should go to the Nuneaton Engineering Co and Reginald Stanley the inventors of this fine piece of machinery.